To me, feminism means that your gender shouldn’t affect your opportunities. And I think most people would broadly agree that this should be the case. That women should earn the same as a man for the same work seems pretty universally accepted, for instance. Despite legislation, however, a gender pay gap remains. Focusing on pay is useful to illustrate the fact that we haven’t yet achieved an equal society, but it’s not what I want to focus on today. Equality isn’t just about money; it’s also about opportunities to find and excel at something you love. Why is it that only one in five software engineers at Google are female? Why is it that, internationally, only 9% of IT leadership roles are held by women? Why is it that only 31% of Facebook’s entire staff are female? Why is it that less than 1% of computer science students in the UK are girls? Occasionally, I’ll hear that the reason for this is that women either aren’t suited to tech or just aren’t interested. (See also: the Damore memo.) I’m highly sceptical that this is the case and I won’t accept the situation as inevitable until we’ve collectively eliminated the factors over which we do have control (factors that I’ll discuss later). In 1843 Ada Lovelace wrote the first computer program. In 1942 Hedy Lamarr was awarded a patent for “frequency hopping”, which underpins WiFi today. The research of Barbara Liskov underpins our understanding of object-oriented programming. 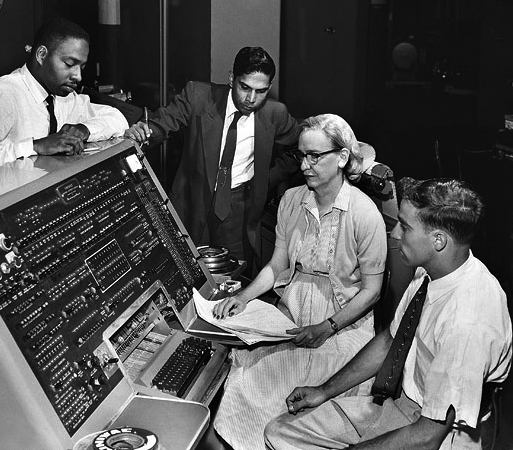 These women are among the heroes of computing and show that women can play central roles in the progression of the field. 1. We all want to share what we love. I really, really enjoy what I do. Between my job and my free time, I spend the majority of my waking hours writing code. Like cooking or music, writing software is one of those skills that can be used for fun as well as for profit. We’re social animals, so when we get pleasure and satisfaction from an activity, it’s only natural that we’d want to share it with as many people as possible. It’s a selfish form of philanthropy. When we exclude women, we limit our pool of potential benefactors by 50%. Plus, some of my favourite people are women. Why wouldn’t I want them to share my passion? Just as programming can be a rewarding activity in the abstract sense, it can also reward handsomely in cold hard cash. As a professional software developer, I’m blessed to be paid to do what I love. Blocking access to software development as a profession (either actively or, as I suspect is more common, passively; because of unconscious biases that disadvantage women) is inherently unjust. If a person (woman or otherwise) stands to better their lot in life by becoming a programmer, I believe anyone with a social conscience should do all they can to (at the very least) avoid becoming an obstacle. Finally, we all benefit from working in teams that exhibit greater diversity. To pick a reductive example, a homogenous team will self-evidently be able to draw on a smaller range of perspectives than a heterogeneous team of the same size. A more diverse team, with a more diverse range of backgrounds and experiences, are likely to exhibit a wider range of ideas, skills, techniques and approaches to problem-solving. Diversity breeds innovation and helps you reflect your customers. When developing software, I’m sure we can all agree that these are things we’d like in abundance. If you’re a man and you’ve read this far, I guess that you are probably (like me) thinking about what we can do to effect some change. Luckily for us, there are women who are happy to provide pointers. In particular, I like these blog posts by Jessica Bell and Ellice Soliven. Listening more to the women already in tech. In practice, this will mean following more female developers on Twitter and actively developing my professional network to include more women in technical roles. Fully celebrating contributions made by female colleagues. Despite always intending to apply complete equality to my interactions, I almost certainly exhibit biases in my reactions to ideas put forward by people of differing genders. The fact these biases and unconscious and involuntary is no excuse – I will make an active effort to assess and eliminate these prejudices. I’m writing these here for two reasons. Firstly, I want the community to hold me to account. If I’m not living up to these commitments, please call me out. Secondly, I hope that other well-meaning men will realise that it’s not hopeless and there is something we can all do. So far I’ve written exclusively about gender. If you’re reading this and wondering why I’ve not touched on other important aspects of identity, I see you. Focusing on gender in this post is simply a reflection of my experience of women, in particular, being so vastly and obviously under-represented. I have worked, for instance, with more gay men than women, and far more non-white men than women. This isn’t to sweep anything under the rug, but rather to justify my starting point. My experience and thinking in this area aren’t fully developed yet, but I can at least appreciate how software development might be less accessible for people of other races, abilities, gender identities, and sexual orientation. I also appreciate that intersectionality matters and that belonging to more than one of these groups may have a more than summative effect. Better understanding other aspects of diversity. This will involve making the effort to listen more to the perspectives of colleagues from different backgrounds. Additionally, I will be more sensitive to aspects of identity in general, so that I can minimise the chance of becoming an obstacle through my ignorance. It’s not perfect, but I hope it’s an adequate start. I’d like to close this blog post with an appeal: please help me be a better ally. I may have lapsed in recent years, but I’m sincere in my commitment to be better, to work harder, from now on. I appreciate that my continuing education in this area is not the responsibility of my female friends and colleagues and that I have to take responsibility for my own growth. That said, I want you all to know that I’m listening and open to suggestions. If I’m falling short, please call me out on it. If there’s more I can do, please let me know. If you’d like to collaborate on any future blog posts on this topic, please get in touch. In exchange, I’ll endeavour to keep sharing these insights with my male friends and colleagues, both on this blog and in person. Lastly, a note to my male readers: I hope you find something in this post that you can apply in your own life. None of us is perfect. I’m sure we could all do more to challenge our unconscious biases and actively support more women into our craft. Perhaps, like me, you’d consider starting by coming out publicly in support of equality and diversity. The reaction of my conversational partner in the interaction I recounted at the beginning of this post really shocked me. In my head, I was a staunch feminist, but many years have passed since I was last an active advocate and I really haven’t been successful in bringing women into tech so far. I can’t allow that to continue. PS Many thanks to my amazing sister Megan. She has been very patient and gracious in providing feedback on drafts of this post. Any errors that remain are mine alone. Love it! Thanks Tom for sharing your thoughts on this. Real food for thought. Throughout history and across the whole gamut of life the role of women and the significance of their contribution has been overlooked, deliberately ignored or intentionally undermined. This is still the case. I commend you for your candour and commitment. I earnestly hope it causes others to reflect on their attitudes and actions as it has me. Thank you.